This week we’ll look at the “Buh” sound. I call this the ‘bouncing ball’ sound. The lips do the same thing for “buh” as they do for the “puh”, one is voiceless (P), the other is voiced (B). 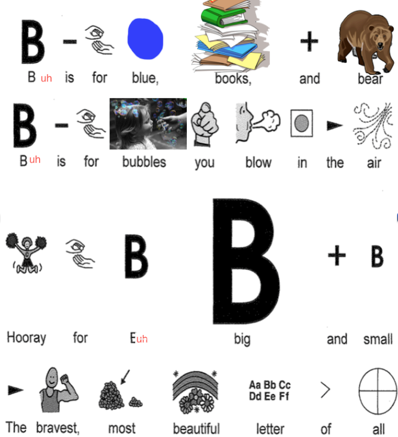 Many of our sounds are paired like that (f and v), (t and d), (k and g), (s and z). These pairs have the same placement of lips, teeth, tongue etc, but one has voice on the other has voice off. Big/little: Gather 4 toys. Look for 2 Big toys and 2 little toys. Now you hide one and give clues to your child to find it. “It’s near the piano. It’s on something soft.” Give as many or few clues that your child needs. Did she find the big or little toy? What is something she/he sees that is bigger than that toy? Now it’s his/her turn to hide the toy and give you clues. Modify and adjust according to your child’s level. Back/front: Look in the mirror and look at the big teeth in the back of your mouth. The ones in the front are smaller. Talk about the back and front of clothing when you get dressed. Talk about the back and front of books when you read. Begin/end: Talk about the beginning and end of the book when you read every day. Ask questions like: Did ______________happen at the beginning or the end of the book? Give answers like, “Goldilocks ran home at the end of the book”. Bottom/Top: Use a bean bag or any toy and move it to the bottom of your foot, now the top. Try the bottom and top shelves of your bookcase. How about the bottom of the cup, and the top. Always remember, every child develops at a different time and rate. If any of the activities are too difficult, modify them for your child’s developmental level.